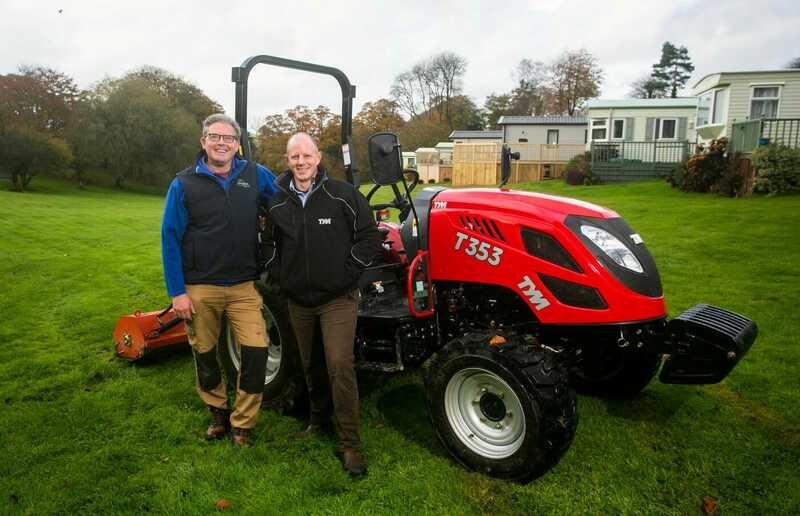 Despite being loyal to another machinery brand for the past 18 years, Smytham Holiday Park in Devon, has made the switch to TYM and purchased a new T353 tractor, to ensure they have the best machine for the large park’s needs. Set in an idyllic valley and surrounded by 33 acres of parkland, the grounds require 10 acres of grass to be cut and collected up to twice a week in peak season. As a result, reliability, durability and power are essential traits for the machinery purchased for the park, says owner, Tony Harper. A demo, organised by Devon Garden Machinery (DGM), saw Tony and his family try out the T353 for themselves. The T353 is already being put to good use. Along with keeping the park in top order, the tractor has been used to move a 12-foot-wide caravan, weighing five tonnes, offsite. “It’s a bit of a funny sight, seeing a little tractor pull a big caravan like that, but it just shows the power it has,” says Tony. With a high base specification, the T353 is suitable for a wide range of tasks such as transportation, ground preparation and seeding and mowing, it’s clear to see why the compact utility tractor is nicknamed a ‘multi-tasking marvel’. The easy-to-use controls allow effortless switching from task to task, while an excellent turning radius and powerful rear lift capacity of 1200kg, makes the tractor more than capable of small and large jobs. Considering all that, it’s no wonder the T353 was found to be the best option for Smytham Holiday Park.